A society is judged by its treatment of those on the margins – the youngest and the oldest among us. One of the passions of a FivestarMan is to be gallant in relationships, which means an authentic man is heroic in the defense of the weak. We treat seasoned adults with the utmost respect and honor due them. Their age and sacrifices deserve nothing less. We must also protect and defend the youngest child. Their promise and destiny demand it. A God-conscientiousness demands guardianship of human rights to life, freedom, and the pursuit of worthy ambition. When a society removes the governorship of God it replaces it with situational ethics which prove to be no more sturdy than the waves of the sea. For example, Heisman Trophy winner Tim Tebow is embroiled in a heated battle with women’s rights groups over a Super Bowl XLIV ad that will play during the game. In the 30-second ad, funded by Focus on the Family, Tim and his mother, Pam Tebow, share her story of choosing Tim’s life over the recommendations of her doctor. The doctor had recommended an abortion because of possible complications. The hypocrisy of extreme feminism is they don’t believe a woman should ever choose to have a baby when they can simply “choose” not to. 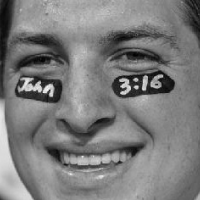 So, Tim Tebow’s talent on the field of contest demands that his voice be heard off of it. He has a right to speak because he had a right to live and we should applaud him for his gallant conviction.